Mark De La Rose and Gwenevere Sisco in Die for Me.. Photo by Brittney Gossett. BOTTOM LINE: A budding drama about two teens finding solace together on a bumpy journey through adolescent angst. In a tiny, East Village black box theatre, ostracized teens Allie (Gwenevere Sisco) and Reese (Mark De La Rosa) nestle into a safe haven from the outside world. Alienated by peer pressure and family expectations, they can only find reprieve in the stolen hugs and kisses they manage to share during fleeting moments of adolescent puppy love. We follow these two through their last year of high school together, as they go through classes, play rehearsals, tests, and prom night. Voiceovers represent the outside world we hear but cannot see or connect to. Actors shift two metal folding chairs around the space to create different sets, but it all feels incredibly bare. 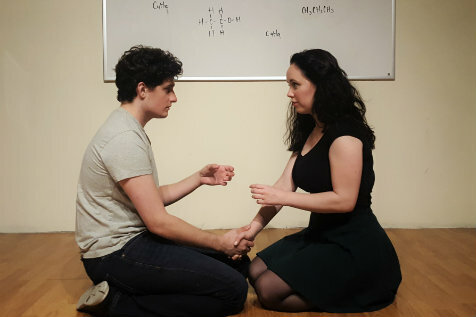 Throughout the play, the voices become more and more hostile and critical towards not only Allie and Reese individually, but also towards their relationship. When faced with the reality that they’re growing out of their teenage infatuation with each other, Allie and Reese decide to make a suicide pact. They will die to keep their love from fading away. What follows in Die For Me are brief snapshots of the pair’s individual unhappy home lives. Allie’s deadbeat father Gerald (Jacob Berge) forgets to show up to her plays and uses corporal punishment, while Reese’s unnamed, high-maintenance parents constantly berate him and question his intelligence when he gets Bs in school. When Allie and Reese finally do orchestrate their suicides on prom night, there is an incredible accident that sets off a wild series of events, derailing the entire tone of the play. While not unreasonable, this twist does little to support what is by far the most interesting element of Die For Me—the relationship between Reese and Allie. Instead, Die For Me embarks on a shaky journey of half-explored themes of family and redemption. With the plot catapulting ahead so rapidly in such a different direction, there’s little time to reflect on why anything that is happening needs to be shown. In fact, most of Die For Me’s scenes are so brief that they read more like film than theatre. Indeed, this play could have plenty of potential as a movie, given the right trimming. Writer-director Ethan Ness has, however, created a very special intimacy between Reese and Allie. Their scenes together are the picture of typical adolescence, yet they aren’t cliché. Their sweet affection for one another grounds Die For Me in an idea that is worth exploring even further. Die For Me is by Ethan Ness. Directed by Ethan Ness. Sound Design is by Traci Bargen. Lighting Design is by Anthony Tornambene. Stage Manager is Staci Merrit. Company Manager is Brittney Gossett. The cast is Gwenevere Sisco, Mark De La Rosa, and Jacob Berge, with the voice talents of Traci Bargen, Leah Coconides, James Denzer, Brittney Gossett, Gabrielle Greer, Kirk Koczanowski, Staci Merritt, Alex Sapozhnik, and Jordan Zauha.